Express Glass and Board Up, one of Miami’s top glass repair services, proudly announces a clarification to the sliding door replacement page. The newly updated page explains repair and replacement differences in new terminology. We decided to clarify our page and confirm that the 10% discount applies to all those services for new customers who mention the discount prior to engagement. Express Glass and Board Up, Miami’s experts in glass door replacement services, is proud to announce a clarification to the sliding glass door repair page. Discounts and services apply equally to sliding glass door replacement service as well as repairs and hardware. To view the updated page about sliding glass door replacement, go to http://www.expressglassfl.com/sliding-glass-door-parts-replacement/. Details clarifying the use of the 10% discount on service for sliding glass door repair or replacement can be viewed at that URL. Miami-specific information on glass repair can be found at http://www.expressglassfl.com/miami-glass-window-repair/. Miami Residents Can Have It All via a Sliding Door Replacement. Sliding door replacement in Miami may appear simple when a professional offers quick service at discounted prices. The confusing piece may arise when a glass repair technician begins to write out the job estimate. Sliding glass door parts such as locks, wheels, tracks and handles can vary in quality and price. Discounts apply to some items, but not to others. As the price for a sliding glass door replacement rises, it may become a confusing and costly headache to the homeowner. Express Glass & Board Up strives to be different from other less trustworthy glass repair services. The company uses its Internet website to issue clarifications on a timely basis based upon customer inquiries and confusion. Express Glass and Board Up has recently announced a clarification to the Miami sliding door replacement page, for example. Replacing an old or broken sliding door can be affordable and easy to understand. The skilled technicians at Express Glass offer the company’s 10% discount to all sliding glass door replacement and repair service and hardware. Miami locals can have excellent service and quality parts all at one affordable price. Express Glass and Board Up Service Inc. is a family owned and operated glass repair business with more than 20 years of experience. Professional technicians and the large variety of inventory make Express Glass a highly-rated glass repair service. If customers are looking for Miami sliding door replacement, as well as sliding glass door repair in Delray Beach or West Palm Beach, please reach out to the company for a free estimate. 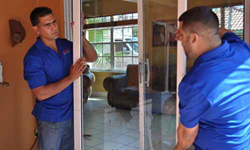 If customers need a 24 hour emergency service for sliding glass door replacement in Miami, Fort Lauderdale or Miramar, technicians are standing by. The company specializes in 24 hour emergency sliding glass door repair and home window glass repair; technicians will handle any glass replacement situation efficiently. Home or business glass repair is the company's main priority.